Greetings from New York, friends! I have been reveling in a, thus far, fantastic vacation far away from DC. Future posts will chronicle the excellent gastronomic aspects of my vacation (from the North Woods of Wisconsin to the hipster haunts of Brooklyn, and even to a quiet farm just outside the city – how’s that for a teaser, huh? ), but today, I want to look back to a meal I enjoyed during the DC Restaurant Week just over a week ago. It was yet another farewell luncheon. Tis the season, I suppose, for the parting of the ubiquitous DC summer interns. His departure conveniently fell during Restaurant Week, a culinary tradition in DC where a prix-fixe menu will get you a $20.12 lunch or a $35.12 dinner at participating restaurants. When the time rolls around, I try to make at least one reservation for the event. Most natives will tell you that Restaurant Week is a mixed bag, however. Although the deal can be extraordinarily good, the quality of the food and service can suffer at overrun or mismanaged restaurants. Nevertheless, it’s a great opportunity to try out some places that manage four $ signs on Yelp, and thus ordinarily are a bit out of your price range. Luckily, our chosen spot, Zaytinya (another of José Andrés’ restaurants) did not disappoint in service or quality of the food. I had dined at Zaytinya on a few other occasions–all with positive outcomes–and was eager to see their performance during a more stressful time, especially when faced with a party of seven, and an individual with some serious dietary restrictions. 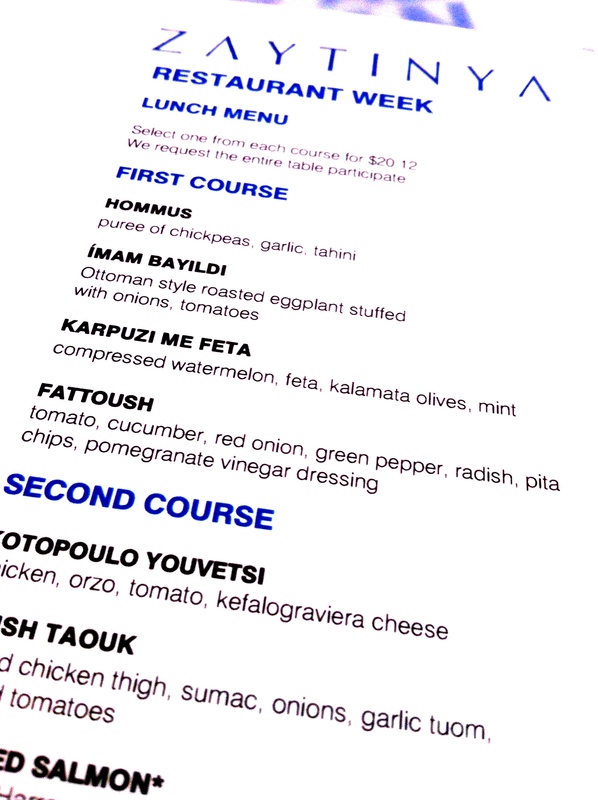 Zaytinya’s special Restaurant Week menu consisted of 4 courses: 3 small plates and a dessert. Theoretically, all members of a party are required to either order off the special menu or the normal menu, but our friendly waiter impressed immediately with his flexibility, stating that he wasn’t too concerned if we wanted to bend the rules a bit. While most of our party did order from the special menu, one had a simple sandwich. With three or four choices per course, it was easy to craft a personalized menu that appealed to each member of our party. I was ready with my selections when the waiter asked for my order; I was also ready for a long conversation about my restrictions. As usual, I explained my allergy to peanuts—the concern immediately assuaged by the waiter’s assurances that there were absolutely no peanuts in house. I went on to describe my intolerance of corn and aversion to legumes. His responses were exemplary, and reflected an accurate and comprehensive knowledge of the menu. He advised that the crispy brussels sprouts and the pita would be fried in oil that also saw the likes of chickpeas, and wondered if that would be acceptable. I was impressed with his foresight, and I assured him that I was fine with that level of contact. The dessert I picked was also full of nuts (walnuts and pine nuts), and I asked that he confer with the chef to ensure that everything I had chosen would be safe. He pleasantly agreed to do so, and later came back with an assurance from the chef that my meal would be handled appropriately, and there was no risk of contamination in the kitchen. 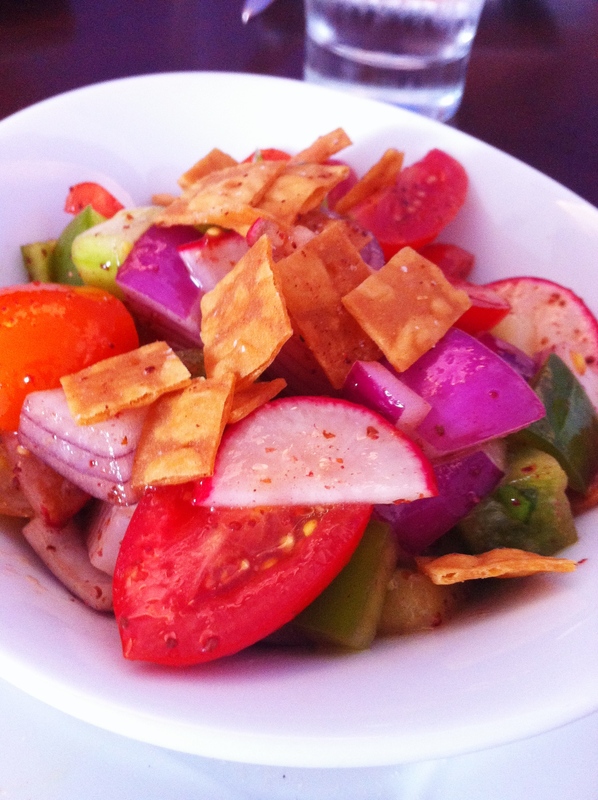 To start, I had the fattoush (tomato, cucumber, red onion, green pepper, radish, pita chips, pomegranate vinegar dressing), a simple and refreshing salad that primed me for the heavier courses. 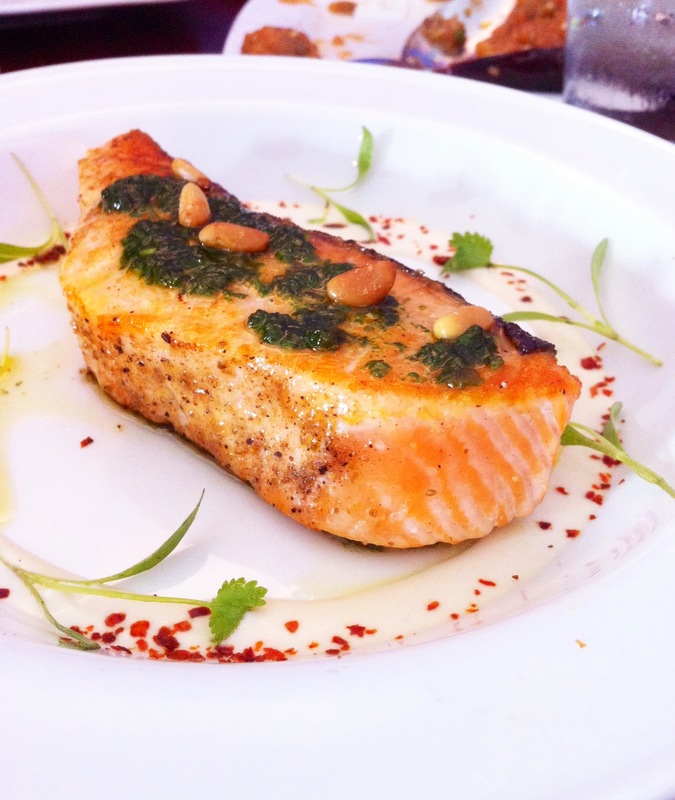 Second, I feasted on a gorgeous piece of seared Arctic Char (Samke Harra-style with coriander, cardamom, pickled Lebanese chiles, pine nuts and tahini sauce) that was a nice departure from the more traditional Greek foods that I usually order. The fish was perfectly cooked (a major feat when dealing with a restaurant literally churning out hundreds of these dishes an hour), and had a surprising interplay between sweet and spicy. 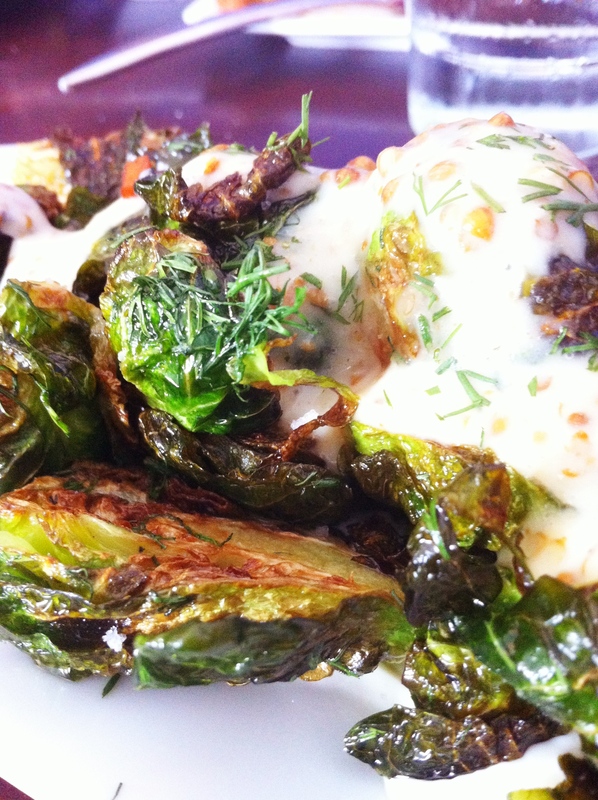 My final dish before the dessert was definitely the best—a platter of crispy fried Brussels sprouts (brussels sprouts, coriander seed, barberries, garlic yogurt) that, again, had a delicate sweetness that really softened the garlicky overtones. My only complaint was that the Brussels sprouts hadn’t been adequately cooked before being dipped in the fryer; the sprouts were slightly too tough for easy chewing. Forging ahead to my fourth and final course despite an increasingly full stomach, I savored a lovely little dish described as “Turkish Delight.” Although traditional Turkish Delight is a confection consisting of a gel-like substance with honey and nuts molded into small cubes, the plate in front of me was an adorable architecture of two scoops of walnut ice cream holding up a crisp slice of philo, surrounded by a sea of yogurt mousse, honey geleé, orange-caramel sauce, caramelized pine nuts. Perhaps this could be deemed a “deconstructed” Turkish Delight, but my general disgust with the real thing certainly biased me in favor of the dish I received. Unfortunately, the ice cream lacked any indication that walnuts were ever present in its creation, and might have been improved by a more intensely flavorful nut like hazelnut. Still, it was a nice complement to the other aspects of the dessert, and the presentation left nothing to be desired. 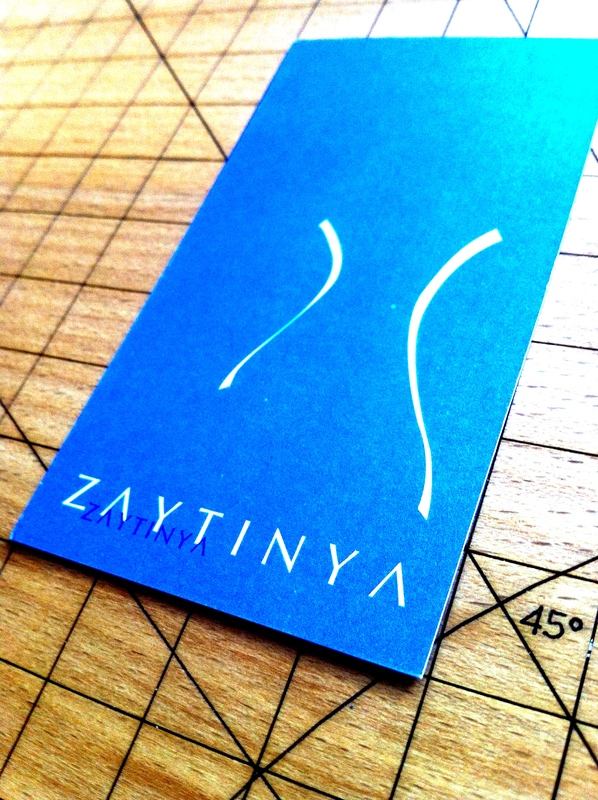 Ultimately, Zaytinya performed well under the pressure of Restaurant Week. 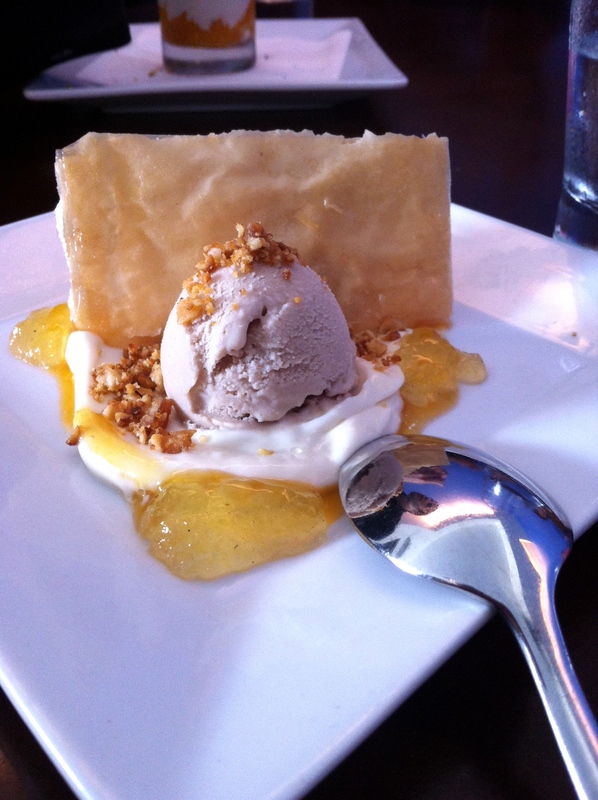 The service was extraordinary—never rushed, and always sensitive to my dietary issues. Except for the final bill, there was no indication that one was participating in any special gimmick—nothing was sacrificed, and everyone left happy. And that’s really how it should be. I tend to make a fuss. Where My Loyalties Truly Lie….